Situated in Jumeirah Beach Hotel Dubai, the new incarnation of Dhow and Anchor known as D&A, is a contemporary British restaurant and bar that is the embodiment of a stylish yet casual dining experience. The newly refurbished interiors introduced high ceilings and industrial architectural details, along with a false viewing platform in the restaurant, recalling factories in Britain. Capsule Arts took this immersive interior design element and industrial feeling as inspiration for the artwork. The art package developed was designed to tell the story of how ale is made, emphasising the British produce and cuisine that the restaurant is known for. For the upper tier of the venue with the factory-influenced viewing platform, Capsule Arts installed a number of large scale photographs documenting ale factories and the brewing process, creating the trompe l'oeil effect that guests are looking through into a real brewery. 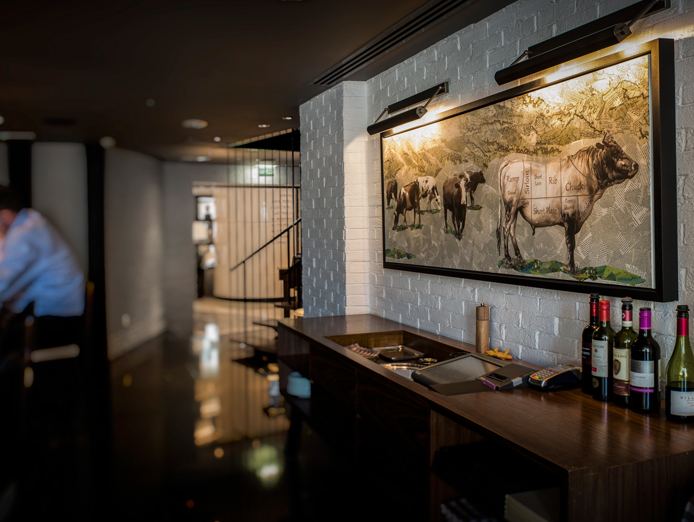 This experience is further enhanced throughout the Dhow & Anchor with a series of large scale photographs featuring vintage imagery which highlight the connection between British industrial factories and British produce. Capsule Arts design team sourced a number of photographs for the project. The artwork design and direction was carried out in collaboration with project interior designers LW Design Group.